Nuon Chea, on trial for genocide, today denied responsibility for the mass killings of his fellow Cambodians – blaming their deaths on neighbouring Vietnam. A FORMER SENIOR figure in Cambodia’s notorious Khmer Rouge, and right-hand man to Pol Pot, told a court today that his comrades “were not bad people”. 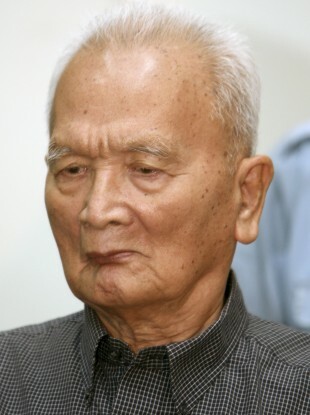 Nuon Chea faces charges of genocide, along with two other surviving members of the regime, for the deaths of approximately 1.7 million Cambodians during the group’s reign in the 1970s. This week the UN-backed tribunal is to focus on charges involving the forced movement of people and crimes against humanity. The other two defendants in the trial are former head of state Khieu Samphan (80) and former deputy prime minister Ieng Sary (86). Both have denied any wrongdoing. A fourth defendant, Ieng Thirith, was ruled unfit to stand trial last week as she is suffering from Alzheimer’s disease. The 79-year-old was the regime’s minister for social affairs and is married to defendant Sary. In 2006, the former head of the regime’s notorious S-21 prison and interrogation centre, Kaing Guek Eav, was sentenced to 35 years in jail for war crimes, crimes against humanity and other crimes. He sentence was later reduced to 19 years. The Khmer Rouge leader, Pot, died in 1998 in the Cambodian jungle at the age of 72. He never stood trial. He insisted that Vietnam was responsible for the mass killings of civilians, the BBC reports. Vietnam ended the reign of the Khmer Rouge when it invaded the country in 1979, installing a pro-Vietnam moderate communist government its place, Al Jazeera reports. After the Khmer Rogue seized power in 1975, they forced urban dwellers to move to the countryside in order to work the land as part of Pot’s agrarian-based communist Utopian vision. However, a total lack of agricultural knowledge amongst the former city-dwellers led to famine and death – as did the long hours that malnourished labourers were forced to work. The Khmer Rogue destroyed anything of intellectual value – books, films or art – forbade the practise of religion, and dismantled the country’s banking system. Educated people and intellectuals were murdered. As well as imposing forced labour, the regime was also responsible for torture and mass killings: it is estimated than 20 per cent of the Cambodian population was wiped during the four-year reign by the Khmer Rouge. Email “Pol Pot's deputy tells court: Khmer Rouge 'were not bad people'”. Feedback on “Pol Pot's deputy tells court: Khmer Rouge 'were not bad people'”.